Tonight I am holding a "Make-A-Plate" party at my friend's house. 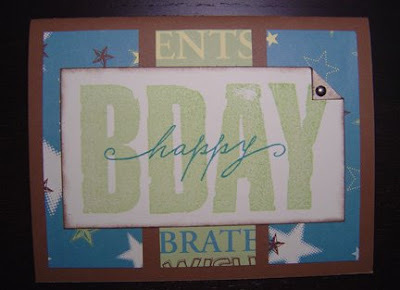 I bring all my stamps and inks and guests choose a design and stamp up a piece of specialty paper. 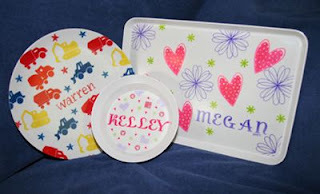 Afterwards, I send off all the stamped papers to a company called Makit, Inc. Makit processes the papers into melamine plates (and bowls and trays). It's a really fun craft night and the projects that are completed really turn out cute. 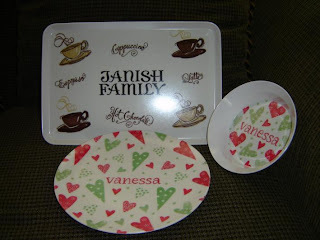 Most everyone makes personalized plates (and bowls and trays) for their kids. This is probably my 5th Make-A-Plate party, and there's always a big turnout. Well, as I've said before, I'm a city girl now. I grew up on a farm though, and my Dad and my brother are still farmers. So, from time to time, you'll be seeing farm-themed cards here! This one is for my Dad's birthday. It's pretty simple, but I think he will like it. I really like the barn image with the silos. There were silos on our farm when I grew up. Also, the buttons I used all came from a stash that I inherited from Mom when Dad gave me all of her old sewing supplies. I have a big box of used buttons from her sewing projects. She used to save buttons from worn out shirts and use them again. She was very frugal. Heck, these buttons might have been from a shirt that my Dad wore at one time! 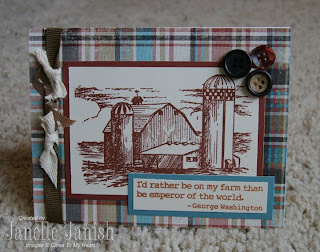 Stamps: Down on the Farm (CTMH), My Farm (CTMH). 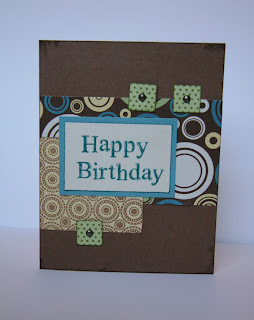 Paper: Sarsaparilla (CTMH), Twilight textured cardstock (CTMH), Barn Red cardstock (CTMH). Embellishments: Twill ribbon (CTMH), brown grosgrain (Michael's), assorted buttons. 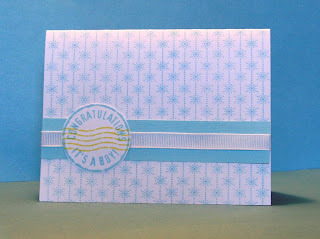 Well, this isn't really my first Stamping Bella card, but it is my first blog post of a Bella card! 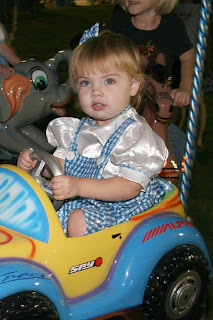 My dear friend Misty Leach sent me this stamped image of "BabyFellaBella". I colored it with my CTMH markers and cropped it down to fit the card sketch that I picked out. 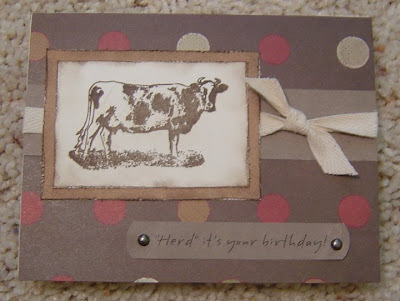 The card sketch is by Amy Rysavy of Prairie Paper and Ink. I love Amy's artwork. She inspires me all the time. I think what I love best about her cards is that the designs are simple yet beautiful. 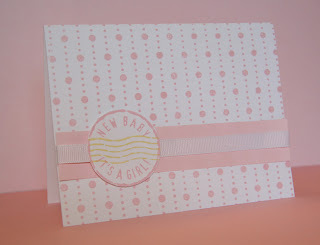 Supplies: Blush textured cardstock (CTMH), Baby Pink textured cardstock (CTMH), Nana's Nursery patterned paper (DCWV), BabyFellaBella stamp (Stamping Bella), Hodgepodge alphabet (CTMH), Key Lime Sassy Strands (CTMH), flowers and buttons. 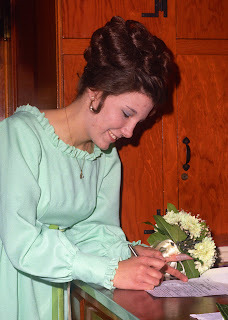 My Uncle Gary recently scanned in all the photos from his and Aunt Jane's wedding, which was in 1974! 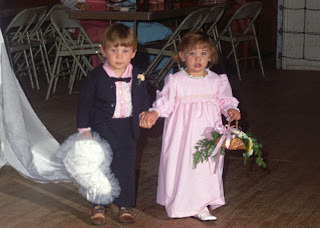 Since I was the flower girl at the very tender age of 20 months, I was anxious to see the photos. 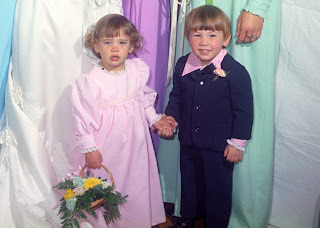 My brother was the ring bearer, and he was not quite 3 years old. I think we were cute, but the story is that I was a terror that day... almost didn't walk down the aisle. My mom was the matron of honor, so she had to walk down the aisle before me, and somehow Grandpa got me to walk down the aisle by myself without crying. He must have bribed me! 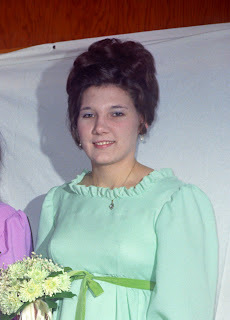 I'm amazed at how young my mom looks... but she was young... only 23 at the time. I think she is so beautiful in these pictures. It was so nice of my uncle to share these with me. 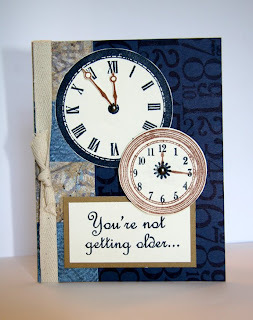 I designed this card at the request of my friend who hosted my last card workshop. She wanted birthday cards for a man. Seems she has the same problem as I do... when I'm just making cards, I usually make "girly" cards, and never think to make man cards! 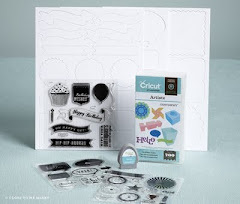 Supplies: (all CTMH), Outdoor Denim cardstock, Desert Sand cardstock, Colonial White cardstock, Majestic Blue paper packet, Pewter brads, Twill ribbon, Chocolate ink, outdoor denim ink, 3-D foam squares. 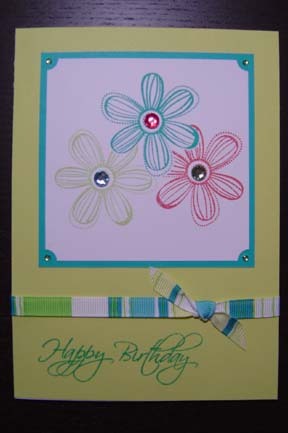 This card was made using a template from CTMH's new Originals book. I just *love* this book. It's my "go-to" for card designs now. 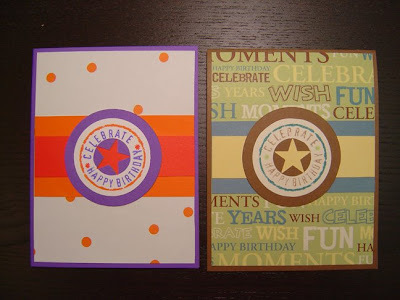 There are lots and lots of templates, and it shows you different ways to use the same template for a variety of cards. 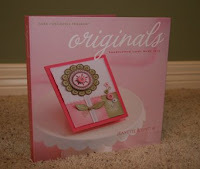 The book has LOTS of pictures, which are so helpful in inspiring ideas. I feel like I can pull out my book, grab a paper packet and a stamp set, ink, and my card comes together in a very short time. I'm posting this even though I created it a long time ago. It was for my daughter's 2nd birthday party. We had a tropical theme. 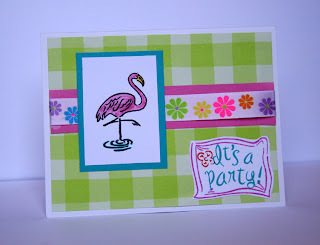 I used the CTMH stamp set "Tropical Christmas" for the flamingo, and just masked out the little Santa hat on his head. 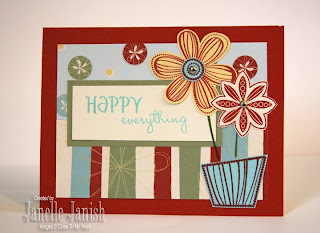 It's a VERY bright card, but I kind of like it! I used up lots of retired B&T for this, too. Supplies: Tropical Christmas stamp set, It's a Party stamp set, Key Lime B&T (retired), Ocean cardstock, Watermelon B&T (retired), Archival Black stamp pad, Ocean stamp pad, Watermelon stamp pad, Orange Stamp pad, ribbon (from Michael's). It's been a whirlwind month. 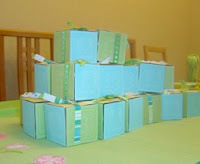 I've been busy traveling for my brother's wedding, holding card workshops and dealing with Hurricane Ike. We've got our power back now, so all is well at my house, but there are still many without power, and worse. I'm very thankful that power is all we lost after the storm. I will be posting LOTS of pictures of my workshop cards soon... but in the meantime, please enjoy these photos that I took in Kansas. I'm very much a city girl now, but my brother's wedding was very country. 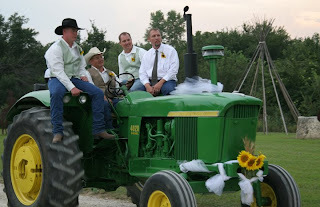 Since he is a farmer, the wedding had a John Deere theme. It was really cute. 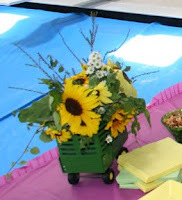 The flowers for the wedding were sunflowers and wheat from his OWN fields! He even drove his tractor to the ceremony, which was outdoors. 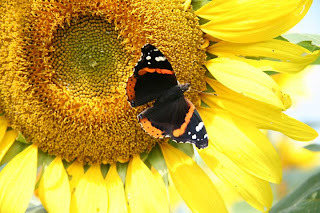 I managed to get a few good shots in the sunflower patch, too. That was fun (but itchy). Greetings! 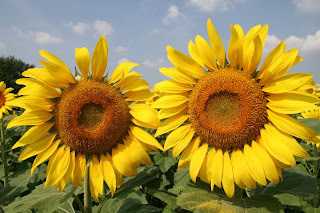 Thank you for visiting my blog and reading my first post. My most recent project was wedding shower invitations for my brother's fiance. They are simple but nice. 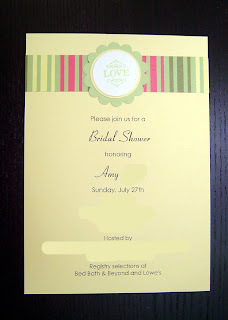 The idea was to create an invitation using the colors for the wedding. Originally, the colors were to be green and yellow... to mimic the colors of a John Deere tractor! But my soon-to-be-sister-in-law toned them down (and added some pink) for a more subtle look (good choice)! Other: circle punches, scalloped circle punch.